At International Airport Review we offer a range of print and online advertising opportunities suited to all our customers’ needs. Our magazine and website are accessed by key decision makers from across the globe, as well as personnel in leading industry associations including the FAA, IATA, ICAO, ACI, AAAE and government bodies. Typical job functions include Airport CEOs, Managing Directors, Purchasing Directors, Airport Operations Managers, Transport Ministers and other senior purchasing personnel. This represents a highly targeted advertising opportunity for companies who wish to influence the key decision makers in what is a vitally important industry. Strategically position your brand within the International Airport Review network to put yourself in front of leaders in the airport and aviation industry. With an audience of 10,100 ABC-audited print magazine readers, 19,879 e-newsletter subscribers and 52,248 average unique monthly website visitors, our brand awareness opportunities enable you to reach valuable prospects, capture mindshare and encourage direct response. 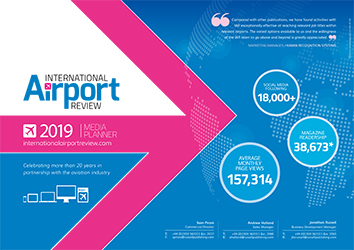 International Airport Review offers a range of integrated marketing opportunities and a variety of campaign elements — print and digital ads, events, social media and more — that can be customised to meet your business goals. 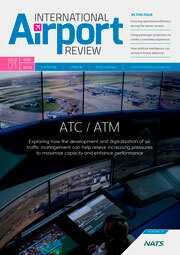 Partner with International Airport Review to showcase your expertise to elite transport professionals. We will work alongside your marketing team to develop a multi-channel plan and create content that communicates your thought leadership, resonates in the marketplace and reaches your target audience. Distributing content through our unique network maximises your reach, reinforces your position as a go-to provider and strengthens your influence within the market. Highlight your product via direct response campaigns within the International Airport Review network to educate prospects, drive engagement and secure business development opportunities. We will partner with you to identify the optimum mix of channels to deliver your message through a range of touch points — in-person at events, web and online communications, and more — to reach your business goals. Delivering tailored communications under the International Airport Review brand to our engaged audience is critical to a successful demand generation campaign. Our events are attended by the leading figures and thought leaders across the aviation industry and we work closely with experts to create the most relevant and topical programmes. We can provide tailored packages to maximise your exposure, return on investment and thought leadership. Contact the team on +44 (0)1959 563311 for more details. If you are an end-user and are interested in submitting an article, please email your proposed topic and/or a brief synopsis to the Editor at: [email protected]. Articles should be high-level and topical, to interest a large number of industry professionals. Articles need to be between 1,500 and 2,000 words in length and you can submit supporting images of your choice. Articles can be written by up to five authors and will be complemented by career biographies and photographs – along with those of any co-authors. Would you prefer to put your opinion across in a series of online articles? Click here to read our some of the articles currently on IAR. There is limited space available in print and on the website, so please indicate your interest as soon as possible. Before publishing your article, we must be in receipt of your signed acceptance form. Articles should be written in the English language. Please avoid commercial bias in the article. Only refer to individual products/processes if it is essential to support the technical content of the text. Unless stated otherwise, your article should be no less than 1,500 words and no more than 2,000 words, not including captions or references. References should be numbered and listed at the end of your copy. Any digital images must be high resolution: at least 300 dpi and saved in either a JPEG or TIFF format as separate files, not embedded in a MS Word document or similar. Please supply a brief biography and high resolution (at least 300 dpi) photograph of the author(s) to accompany your article. The publisher reserves the right to edit any article if necessary, whilst retaining its context. We are not a peer-reviewed publication. Once the article has been received by us, it is not our standard practice to send a proof back to the author prior to publication. Your cooperation on these points will ensure that your article is included at the first available opportunity and reproduced to the highest possible standard. If you have any further queries regarding the above, please contact Anne-Marie McKenna.